I would like to share a view on the EURUSD and DXY, items that typically move in opposition. In the last few weeks things have been shaping up so that this pair may be at a turning point. EURUSD for the upside, DXY to the downside. Here’s my rationale on why. 1- The DEFAULT peak model places the last 18m trough in NOV2018. It also places an 18m peak on FEB2018, and expects the 54m peak in about SEP2019. The CML is bullish till SEP2019, but after that it is very bearish for a very long time. This is because this DEFAULT model assumes a 54m trough in JAN2017. This makes a BIG difference. 2- MY EURUSD model (which has different cycle lengths from the DEFAULT model) also has the last 18m trough in NOV2018. It assumes JAN2017 as a more significant 18yr trough. The peak model also thinks that FEB2018 was an 18m peak, and that the 54m peak is still to come in SEP2019. The big difference to the DEFAULT model is the CML estimate, which is bullish till the 54m peak in SEP2019, then retraces somewhat to mid-2020, and then continues powering on up. 3- This third model is a pessimistic view, but a possible one. A 9yr peak in FEB2018, makes the CML estimate be bullish till the next 18m peak in about JUN2019. After that it projects a move down to the next 18m trough in mid-2020. Only after this trough is the CML bullish in similar fashion to the second model. 1- DEFAULT model expects FEB2018 to have been a 9yr trough. CML projects a move down to a 20wk trough in MAR2019. Then choppiness till the 18m trough in SEP2019. Following it is bullish till the 54m peak in end 2020. 2- MY DXY model expects FEB2018 to have been a 54m trough. I am placing an 18m peak in MAR2018, where the average value is expected. It is as you can see close to a significant trough, so it may be controversial. But I don’t like where Sentient is otherwise placing it. This model expects we have just seen a 40wk peak, and that we will move down to the next 18m trough in about MAY2019. Following is a bounce to about SEP2019, but from here it is downside movement all the way. DeMark comments: None. Maybe someone can add ? The highest likelihood scenario, and CML best fit, for EURUSD is solution 2 (also accounting for DeMark info). For the DXY, same reasoning gives solution 2 as highest likelihood, even with my own assumptions along the way. Their inverse projections match, not with absolute precision, but in a fair degree. Welcome, and thanks for the analyses. I wanted to comment on your EU charts with a peak placed around Feb. 2018 and a trough pinned around Nov. 2018. I apologize if my chart is difficult to read. I no longer trust ST to make my phasing choices and do it entirely by hand on the advice of a respected Hurst analyst. Since I am familiar with MT4 and its tools I use it as my tool of choice but it is no good at keeping manually-placed objects at consistent levels so I make do with vertical lines. Dashed lines are peaks, and broken lines are troughs. The horizontal lines are part of an attempt at finding the mean, median and modal averages for cycle durations. I also place the 9y peak 02.2018 for EU. Coming down from such a peak we would expect much bearishness even after a large cycle low like the 18m. And so this is one of the difficulties of using the cyclic model to make trading decisions. Suppose I place a 20w peak at 2018.07.09 which is logical as it occurs 21 weeks after the Feb. peak. I draw a VTL from the peak to the peak (green sloped line) and where it is broken (not just pierced but at least one whole bar entirely free and clear of the line) I assume we have seen the 18m trough at 2018.08.12. This is what Hurst tells us. A break of the 20w downward VTL means that we have seen the 40w trough and since we already have placed a 40w trough that makes this trough one degree higher - 18m. The timing is about right, making this 18m cycle 19m in duration. However price continues to drop and forms a new low in November creating a cycle 22m in duration, still valid but on the long side. Now is this the TRUE 18m trough? Perhaps price will continue to rise from this point and reach the 9 year VTL line (purple) but I suspect it will rather kiss the 18m (yellow) line and continue to fall. This strong downward trend makes choosing troughs almost arbitrary. The same problem occurs in strong bull trends when selecting peaks. Most Hurst analysts are used to re-positioning their pins after a new low or high takes them by surprise. I’m not sure if Hurst would approve of this goal-post moving as he had a scientific mind and wished to create a scientific system. However I would prefer to use what I know - the scientific method - to evaluate the plausibility of Hurst’s techniques. We need a less wishy-washy method of phasing else this theory must be abandoned in favor of something with better predictive power. My current attempt is to use the duration and the percentage move after each suspected peak and trough to gauge its potential as a valid candidate. Not only will this help with phasing but it will allow a trader to make decisions like - is it a good idea to attempt to enter a trade if this really is an 18m trough? How much of a retrace should I expect if it’s a TRUE 18m trough? For example after 2018.08.12 price rose for nearly 6 months, a 4.5% retrace. Is that what we should expect from an 18m trough occurring after a 9y peak? We would need to compare it to past history (I call this the ‘cycle lineage’) to decide, adjusting for changes in overall volatility, and of course, compare it to moves in other instruments (principle of commonality). If there is too much difference in expected amplitude from one cycle family member to another then this method is no better than random chance. In this case I believe it is consistent with past moves and so I will retain my August position for the 18m trough. Although I will have to wait a while to get another opportunity I will know that I should expect to have around 5-9 months of bullish action after any 18m trough even prior to a major peak like the 9/18y peaks. Of course I won’t know for sure until we see what the EU does in the next few months. If it continues to rise then maybe Nov. is a better choice for the 18m. One problem with my phasing is the 20w trough is early, and the position of my 40w peak is now quite long. I generally expect vigorous movement after 40w peaks and troughs so if it doesn’t happen soon I will have to revise. All this effort and second-guessing does make me wonder if it isn’t simply more effective to stick with moving averages and wait for crossings. I’m sorry I don’t have a similar DXY forecast to share with you but you are of course correct that EU and DXY usually move in opposition which is only natural since DXY is an index of the value of a US dollar against a basket of non-US currencies, and the EU is the Euro compared to the dollar. Thank you for such an elaborate answer. I see you also follow these instruments closely. And I see that you are very thorough. 1- I agree that the choice of the FEB2018 peak and the NOV2018 trough will greatly determine your future estimates. Period. in AUG2018. Together with the fact that NOV2018 came down lower than AUG2018 makes it, in my view, a more probable candidate. 4- On a less important level, if I let the 18m trough stay in AUG2018, the CML estimate is very bullish from AUG2018 onwards, which does not really agree with real price movements since then. 6- I am curious on your comments about not trusting the Sentient phasing. Can you elaborate why ? Hi guys, I wanted to add that Ive found the hardest part is reversing your decision quickly when you get new info. Such as in October and November with china trade wars heating up, an 80 day trough evaporated… its tough to see that loss if you thought long “c” interaction. It broke the cycle in a straddle, so we have to see that and trust the analysis. Keep accurate account, then find a good place to short. That is what this seems to be about lately. Taking losers, and quickly seeing the larger trend down for equities. Now with your posts, I believe we have a situation occuring that looks plainly obvious. Its waiting for the news and noone is betting anything. So range trading. 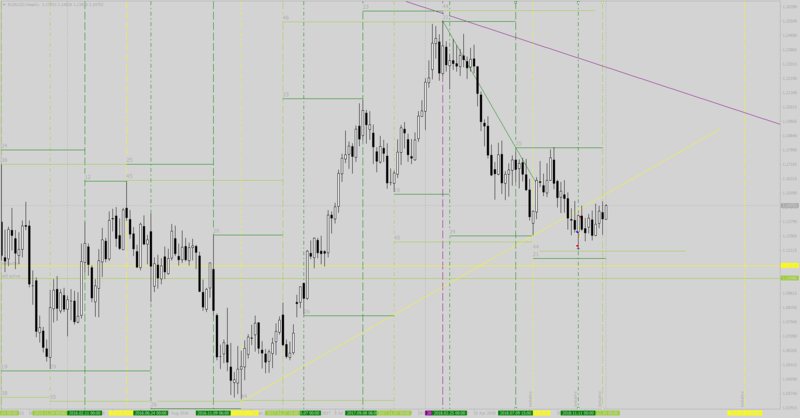 If it goes lower this week that indicates an “h” interaction, to me, on eurusd. What I want to share is fibre is not making the lowest yet. March 27 is brexit deal or no deal. Therefore it will be a continuous drop until april when there is negotiation. Therefore dollar still rally until major block.